How are you all doing? Has it been a good week for you? I hope so. Mine is a mixture of many things. It’s a bit overwhelming, a bit dizzying. But, maybe that’s what makes life interesting. Because it prompts me to be spontaneous (those in the know knew that I made a last minute decision to spend last weekend in Bali with one of my best friends; photos to come later!). So, I got two correct answers for last week’s quiz. It is Arc of Constantine, a monument built next to the famous Colosseum in Rome. It looks rather nice seen from atop the Colosseum, doesn’t it? And I heard, there’s a small stall selling pringles nearby too (not that it’s important hehe). Now, on to the next episode. This is an edit of a photo I took in Florence. I really admire the sculptors of ancient Italy. They made statues look so real: the muscles, the curls of the hair, the expression, the rumples of the robes. Just amazing. 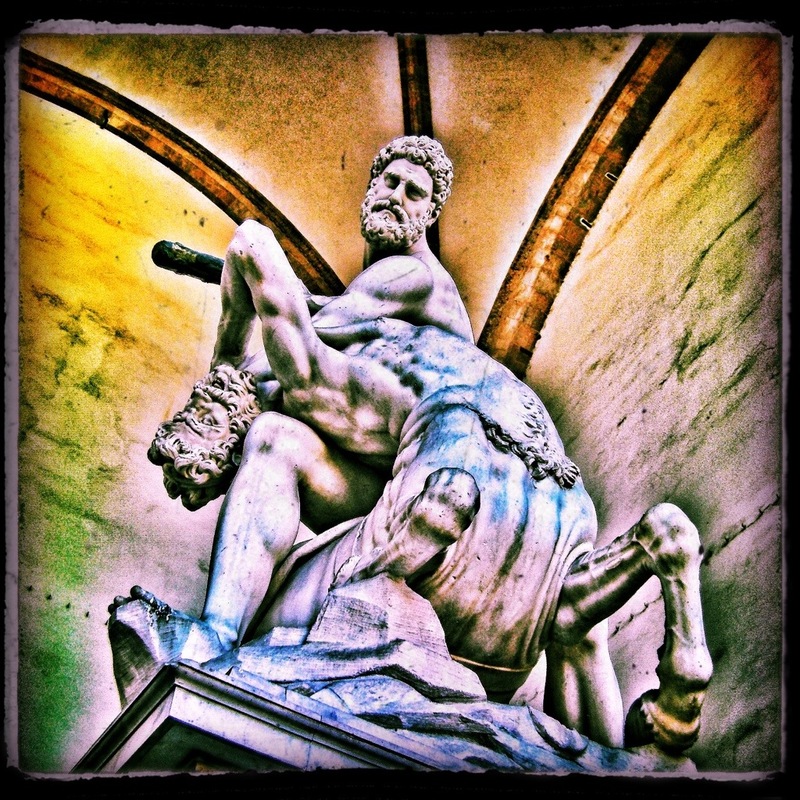 This one is the statue of Hercules defeating a centaur. What you need to tell me is: where it is exactly in Florence. Name the exact location! Of which, the first part of the sentence is what is happening in my life and the second part is what I am telling myself repeatedly. But, I guess each of us have our own “cross” to bear. So, am not whining, just sharing 😉 and if (though I hope it’s not the case) in anyway, you feel that things have been tough for you, you know you are not alone. I’m there too (hey, I spent one day inside a high voltage power substation last week and potentially will spend a day or two on some rig offshore floating on the sea somewhere in the near future). Stop with the shabby part. Now, the fun part. FIrst, no one was able to get perfect score for the last Italian Series quiz. Most can answer correctly that Florence’s Italian name is Firenze. But, not the bridge, whose name is Ponte alla Carraia. 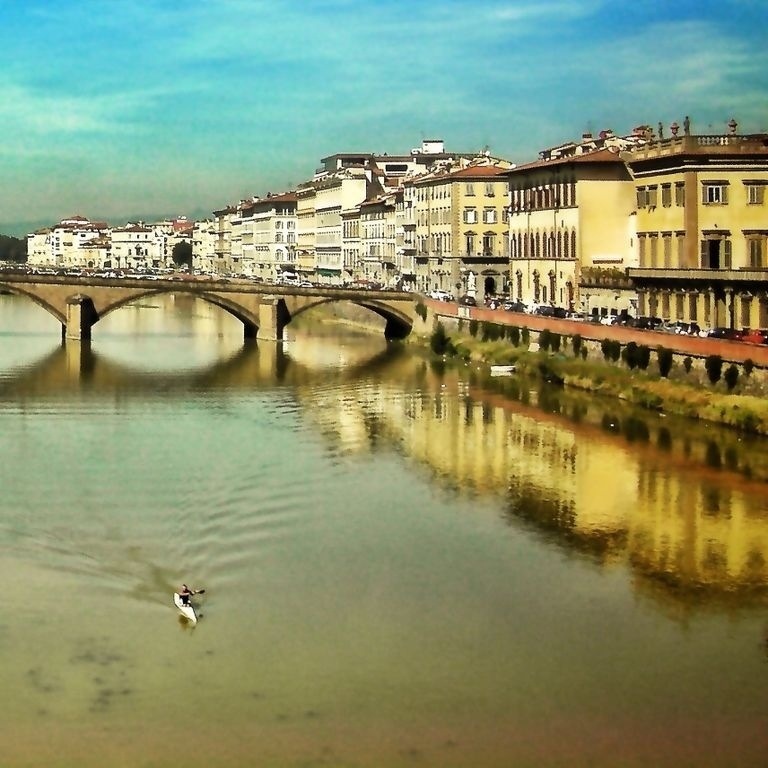 There are six famous bridges in Florence. Ponte alla Carraia is the third oldest and leads you to the best ice cream place (gelateria) in town. Now, actually, my trip to Italy started in Rome and in a rather scary way. So, I got off the train from the airport and was looking for the exit that led to the street which was supposed to lead to my hotel. I had my big luggage with me and I found that I needed to carry it down quite a number of steps. Cut the long short, a guy came out of nowhere, spoke to me in Italian, and grabbed my luggage while leaving me panic stricken, ran downstairs laughing and shouting at me “Relax!”. I was quickly assessing the situation: checking to ensure all my documents and money are in my backpack, how to contact my best friend who lived in Paris, how to talk to the police, etc etc. But, all my anxieties died as I saw the man waiting for me to catch up with me and then handed over my luggage. I guess the Italians have this thing about helping dames in distress in the most straight forward way. Now, let me see. I am not going to give you the famous basilica dome or the colosseum. That would be too easy. Let’s try this one here. Name the structure and then go enjoy your weekend with your loved ones! 2. What is the name of the bridge in the picture? Here is the picture. Email me the answers. First one with correct answers will be…blessed 😉 have a super weekend!